Boyds, Md. 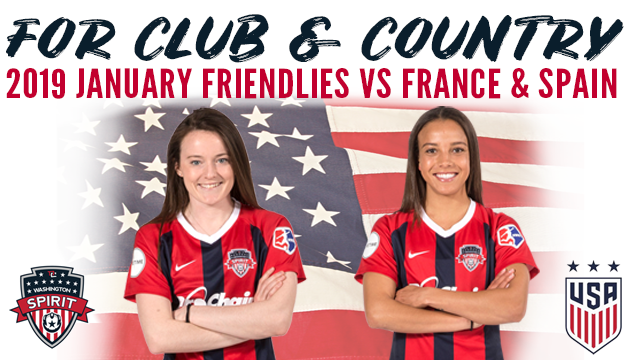 (January 4, 2019) – Washington Spirit midfielder Rose Lavelle and forward Mallory Pugh have been selected for the U.S. Women’s National Team’s 26-player roster for January training camp. The first U.S. WNT training camp of 2019 will be held in Portugal, and will be followed by the USA’s first two matches of the year, against France on Jan. 19 (2:30 p.m. ET on FS1) and against Spain on Jan. 22 (2:30 p.m. ET on ESPN2 & UDN). Lavelle enters 2019 with 20 internationals caps and 6 goals, while Pugh has 43 caps and 12 goals. Both Pugh and Lavelle helped the USA qualify for the 2019 World Cup during the team’s title run at the 2018 Concacaf Women’s Championship. The USA will spend just over a week in southern Portugal, which marks the team’s return to the Algarve region, a yearly destination for the USA over 20 Algarve Cup tournaments between 1994 and 2015, before traveling to France to face the 2019 FIFA Women’s World Cup hosts at Stade Océane in Le Havre, one of nine World Cup venues and the site of the USA’s third Women’s World Cup Group F match on June 20 against Sweden. The USA will then travel to Spain to face the rising the European power which will compete in its second Women’s World Cup this summer. The match at Estadio José Rico Perez in Alicante will mark the USA’s first match against Spain and in Spain.